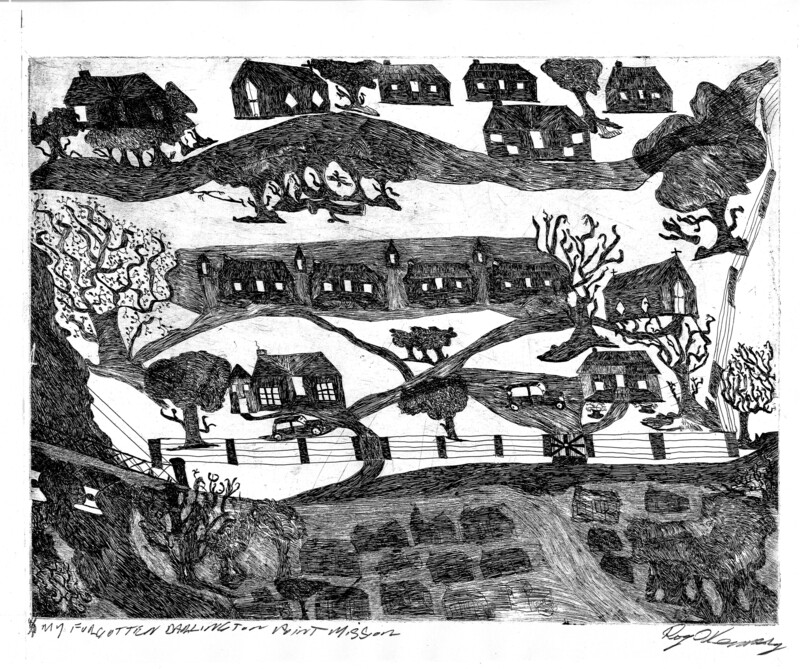 My forgotten Darlington Point mission / The forgotten missions at Darlington point and its two missions in years gone by / The forgotten Darlington Point and its 2 missions in years gone by 1999 etching printed in black ink 25.6 h x 34.0 w cm. Courtesy Roy Kennedy. 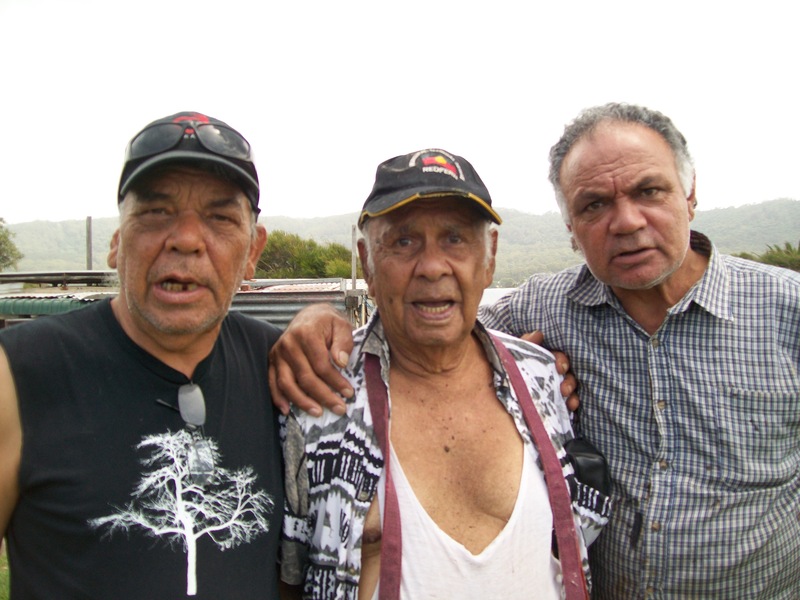 Roy David Kennedy born 1934 is a Wiradjuri man who grew up by the Murrumbidgee at the Darlington Point Police Paddock mission. 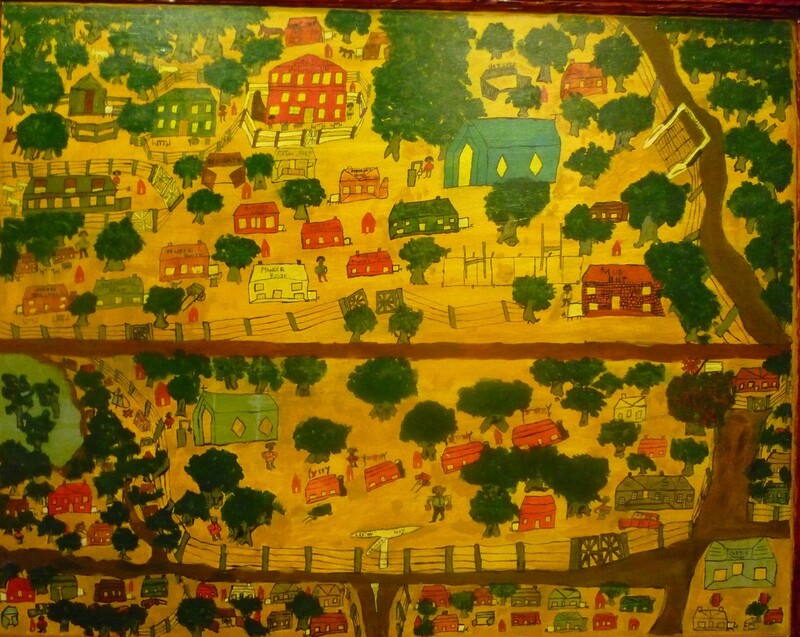 His art documents his early life with his Kennedy and extended family, who had been displaced to the police paddock by the closure of Warangesda Mission in the mid 1920s. His art also reaches back into the memory of his grandfather David Kennedy and his mother Jessie. Jessie was born on Warangesda in 1910 and at the age of seven taken to the Cootamundra Girls home by the Aborigines Protection Board. She returned to Darlington Point as a young woman. Following a lifetime on the move, Roy settled in Sydney, at Waterloo and in 1995 began to attend the Eora College, Sydney Institute of TAFE New South Wales ‘to get some education.’ After initially experimenting with ink on paper, in 1998 Roy was introduced to painting, ceramics and print making and his career as an artist took off in the following year. He graduated from TAFE NSW in 1999 as Aboriginal and Torres Strait Islander student of the year and also received a commendation award for his Mission Series etchings in the inaugural TAFE NSW Invitational Arts and Design Prize, Australian Images and Perceptions. In 2000 he was an Arts and Design Prize finalist for the etching The forgotten Darlington Point and its two missions in years gone by (also called My forgotten Darlington Point mission) and again in 2003 for Movement on the Murrumbidgee river. From this promising beginning he has gone on to exhibit at a variety of venues in New South Wales, Victoria and the Australian Capital Territory, and at Boomalli Gallery (Leichardt, New South Wales) as a member of Boomalli Aboriginal Artists Cooperative. During the last decade his works have toured Australia with the Telstra National Aboriginal and Torres Strait Islander Art Award, the Kate Challis RAKA Award and the National Indigenous Heritage Award 2000, in which he was highly commended for the etching Woddi will be forever. In 2007 he was a speaker at the 6th Australian Print Symposium in Canberra, when his etching How soon they forget was included in the accompanying exhibition The story of Australian printmaking 1801-2005. From its inception in 2005, he has been a consistent finalist in the Parliament of New South Wales Aboriginal Art Prize, and was the winner of this award in 2009 for his painting Mission Series 2. His work is represented in the collections of the Art Gallery of New South Wales, the National Gallery of Australia and the Parliament of New South Wales, as well as in private galleries and collections in Australia and overseas. Since 2005 his etchings have begun to take new form and assume a new life as mural and mosaic. 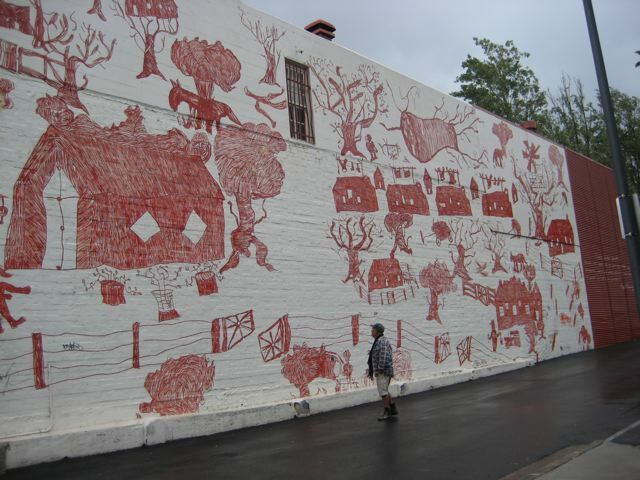 Mission boy dreams is displayed with its story on the Wyanga Aboriginal Aged Care building, Redfern and Movement on the Murrumbidgee river, in 2009 was replicated by Sophie Verrecchia as an external coloured mosaic commissioned for a Sydney residence by Gavin Jones. How soon they forget: the art of Roy Kennedy is an attempt to give some historical background to Roy Kennedy’s two missions as well as to clarify details about Roy’s life, including the place and date of his birth and the mission he lived on as a child. It seeks also to show the significance of Roy’s art as personal and community history and the importance of seeing his works linked to their accompanying stories. This is essential if their full potential, as envisaged by the artist, is to be realised. It reveals them as multi-layered, composite and compelling statements, communicating the past to the present and to future generations. An examination of Roy’s work and its stories, moreover, shows that the portrayal of his missions, although individual and idiosyncratic, has parallels and connects with other Aboriginal artists reaching back in time and beyond his immediate country. If the essence of Roy’s art lies in the way he draws on his memories of forgotten landscapes and re-creates them in tangible and accessible form, its power derives from the fact that by this process, the places in his mind are emerging to enter the consciousness of those who follow him. In a further development, his works, reinterpreted as mosaic and mural, are in the 21st century themselves becoming part of new physical landscapes. Roy’s declaration, ‘How soon they forget’ is the title of an etching as well as a consistent theme in his ongoing commentary. 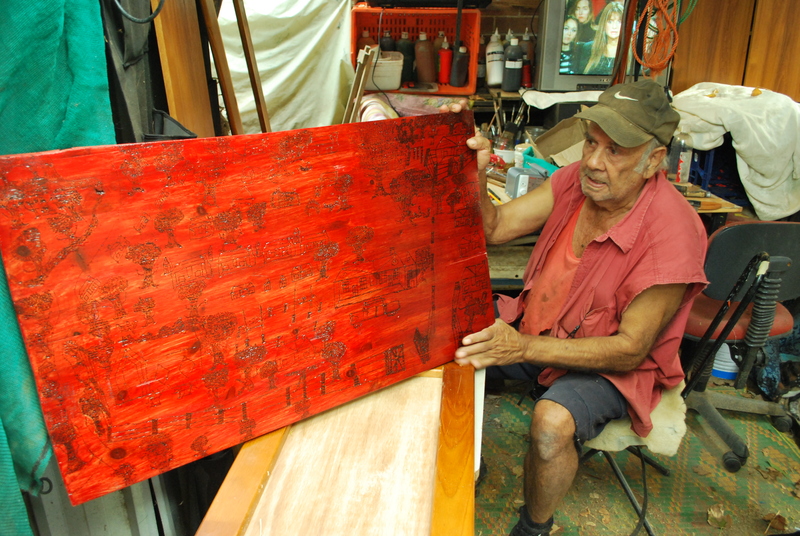 In 2009 Roy was the winner of the Parliament of New South Wales Aboriginal Art Prize, his winning entry Mission Series 2, a painting of his two missions. This award, in conjunction with all he has already achieved as an artist, is an indication of the success of his quest to ensure that the story of his early life and his mission community will not be forgotten. How Soon They Forget Introduction page ix. An exterior wall of Wyanga Aboriginal Aged Care facility in Redfern is the location of a re-creation of Mission boy dreams 2005. This work was selected by workers from the facility from options which were suggested by Cracknell & Lonergan, the architects for the refurbishment of the building. The reproduction (painted by Danny Strachan) has been transferred as etched on the plate but while the background remains white, the black ink used in printing the etching has been replaced by red paint. The fact that this etching is on the wall of an aged care facility, whose members include people with memories of the Police Paddock, and is also on public display for all ages to see and question, seems particularly relevant to the intention of Roy Kennedy’s art. The artist statement – ‘From as far back as I can remember, I’ve always wondered when we would have our own home and 70 years on I’m still wondering’ – is placed at the right hand extremity of the mural. This links the past with an ongoing present, connecting with broader issues still unresolved for Aboriginal people. How Soon They Forget page 45. Mission boy dreams 2005, transposed to the wall of the Wyanga Aboriginal Aged Care facility, Redfern, Sydney. Roy Kennedy looks beyond the Police Paddock gate to the mission of his childhood. Photograph Isabella Edquist. Roy Kennedy’s winning entry in the Parliament of New South Wales Aboriginal Art Prize 2009. The painting Mission Series 2 2009 (acrylic on board 118.8 x 145.7 cm) shows Roy’s mission – the Police Paddock and his mother ‘s mission Warangesda. Courtesy Roy Kennedy. Photograph Peter Lonergan. Roy Kennedy’s works are represented in Australian and overseas galleries and private collections. Home: Aboriginal art from New South Wales is a printed education kit which was launched in June 2013. Roy Kennedy is among the twenty five New South Wales artists who are featured and his etching Mission Boy Dreams forms the cover page. Home celebrates the work of over 25 significant Aboriginal artists who belong to nations and language groups that today fall within the area defined as New South Wales. Their work highlights the cultural diversity of Aboriginal nations, or language groups, across the state, and shared concepts that bind Aboriginal artists and their communities together. The art is drawn from the collection of the Art Gallery of NSW along with other regional galleries and organisations, as noted below. An exhibition of the same name was held at the Gallery in 2012. Home: Aboriginal art from New South Wales. Home features Roy’s etching Mission Boy Dreams and compares Roy’s work with South Eastern Australian 19th century artists Tommy McRae (1835-1901) and Mickey of Ulladulla. (1820 -1891). How soon they Forget the art of Roy Kennedy (Philippa Scarlett 2009) as well as comparing Roy’s work with McRae also sees connections with Victorian artist William Barak (1824-1903) These demonstrable links with earlier Aboriginal artists emphasise the fact that Roy’s art, while telling a story related to his people’s experience of mission days, is not simply isolated expression.